Charmin Essentials Strong Toilet Paper (24 Giant Rolls) – Only $8.99! Running low on toilet paper? 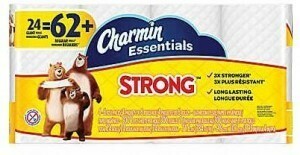 Head over to Staples where you can get Charmin Essentials Strong Toilet Paper (24 Giant Rolls) for only $8.99! Or if you select 1-hour pickup the price will drop down to only $7.55! Since 24 giant rolls equals 62 regular rolls, it’s like paying only $0.12 for each regular roll! Nice! You can pick this up for free at your local store, or you can get free shipping on orders of $14.99 if you’re a Staples Reward member. It’s free to join!